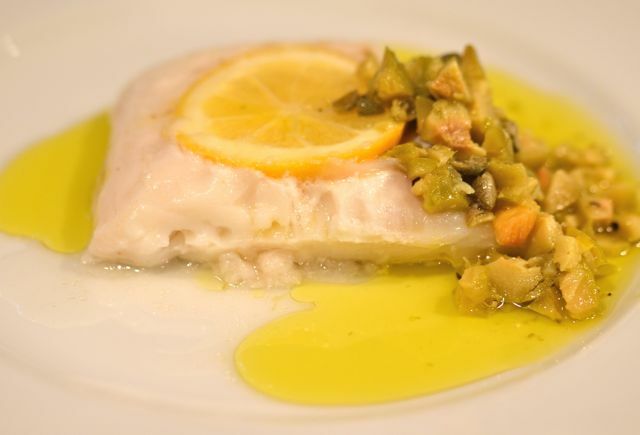 Green Olive-Lemon Relish With Sous-Vide Halibut. Please pardon the somewhat strange title. Usually we would lead with the fish, but this dish really is all about the relish. We are big fans of salsa verde here at the farm, it works on veggies, chicken and fish- particularly during the summer. 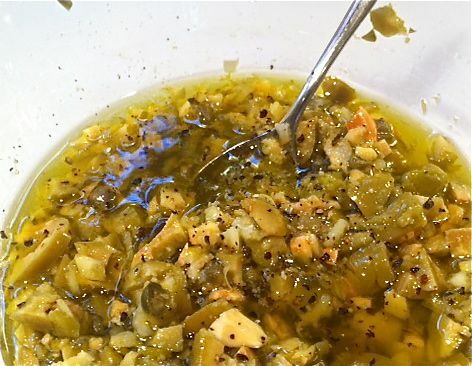 But we are always looking to branch out and discover new flavors, and we happened to find this recipe for green olive-lemon relish from Judy Rodgers of the Zuni Cafe in San Francisco. And Judy Rodgers notes that this relish works on fish, chicken, pork and grilled vegetables and is easy to make. So we gave it a try. Few ingredients, but lots of flavor. And we are glad we did. 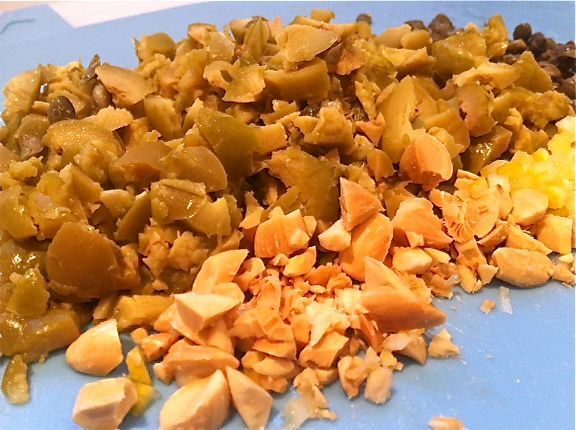 This relish is a simple mix of firm green olives (Lucques or Ceregnola are good), diced lemon, chopped almonds, a touch of capers, lemon juice and olive oil. The flavor profile is very similar to salsa verde but the olives, almonds and lemon pieces give the relish more body and heft. The relish has a nice balance of sour and briny notes from the olives, lemon and capers, while the almond and olive oil add nutty and sweet notes. 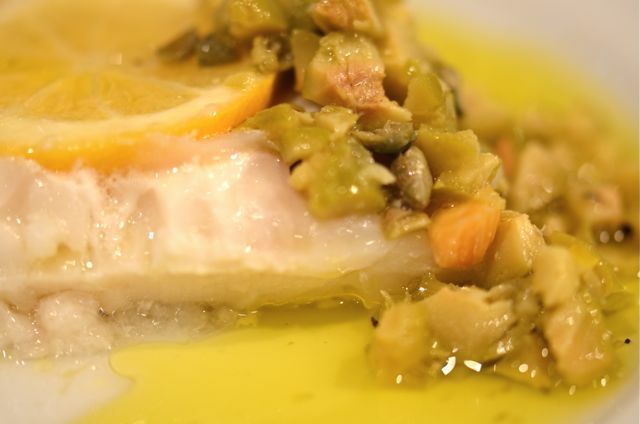 We served the relish with sous-vide halibut at 122 degrees using our basic method for sous-vide fish (here is a link to a good oven-based method) and it was a lovely summer meal. This relish would work very well with any firm white fish- so we suggest you use whatever cooking method you like and then simply add the relish. And if you grill eggplant, squash or zucchini, this relish will be a great partner. Pit and chop the olives. Add chopped lemon, almonds and capers. Combine with olive oil and lemon juice. The relish goes with fish, chicken, pork or grilled vegetables. We made sous-vide halibut. Making the relish couldn’t be easier. Skin, roast and chop some almonds (or use store-bought roasted almonds, unsalted Marconas would be very good), dice 1/4 of a lemon, pit and chop the olives, add some capers and a bit of extra lemon juice and then add the olive oil. A neat trick here is that you can add varying amounts of olive oil and still have a good relish. If you want the relish chunky, add less oil, if you want to use it more like a sauce (good with fish) add a little more oil. Both versions taste great. So if you like salsa verde in your summer meals, give this relish a try, it will be a very tasty change of pace (you might even like it better than salsa verde). 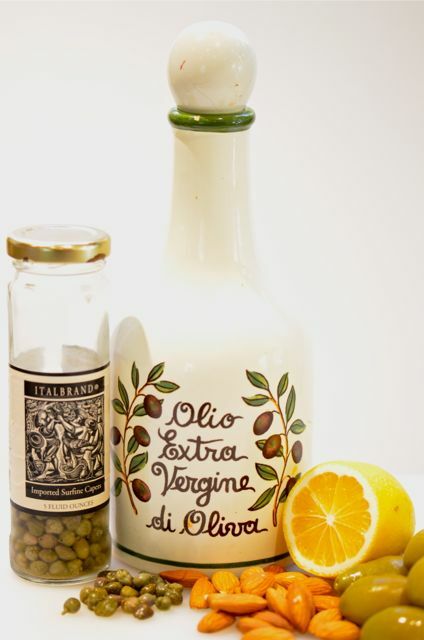 Rodgers suggests a few types of olives for the relish including Lucques, Ceregnola, Ascolane and Picholine. But she notes that if the Picholines (or any of the olives) seem extremely briny to blanche them for 2 minutes to soften their flavor. If you want to skin and roast your almonds, simply blanche raw almonds in boiling water for 10-15 seconds, then cool and skin (the skin will come off easily). Then roast the almonds in a 300 degree oven for about 15 minutes, or until they color slightly. Make extra- freshly roasted almonds are very tasty on their own. What You Get: A bright, tasty relish for fish, chicken, pork or vegetables. How Long? 5-10 minutes of chopping. And extra 15 minutes if roasting your own almonds. Anytime dish. Rinse and dry the olives and then remove the pits by pressing/smashing the olives with a mallet or a small pan (we use a small pan). Once the olives are smashed the pits will be easy to remove. Roughly chop the olives into uneven pieces. You will end up with about 1/2 cup of chopped olives. Dice the lemon into very small pieces, do not use the end of the lemon as it has too much bitter pith. The lemon dice should be the texture of confetti. Roughly chop the almonds and capers. In a medium bowl, combine the chopped ingredients with the lemon juice and olive oil. Use more or less olive oil depending on the consistency you want. Taste for seasoning (usually you won’t need salt, a pinch of pepper is good). Serve. Do you have any suggestions for other fish that would go well with this relish, grilled perhaps? Thank you! Striped bass, cod/hake, grouper, snapper will all work. Grilled swordfish also very good here. Not a white fish but seared ahi is also good with this kind of sauce / relish. Thanks, we have local, wild snapper and grouper here so we’ll give this a go! Interesting. Even though olives and lemons are not local to Minnesota this might be worth a try at our restaurant in the “real” food category. We have found that customers love green olives around these parts. Thank you for sharing. The relish sounds really delicious. For vegetarians, would you advise using this on bruschetta or with a radicchio salad? Or would you advise altering the recipe if you were eating on something other than fish? This relish looks fantastic and, as you note, very versatile. I don’t often come across recipes that use good green olives (aside from martinis 🙂 so we will be trying this for sure! Sous-vide is very cool and really works, it is just an investment. 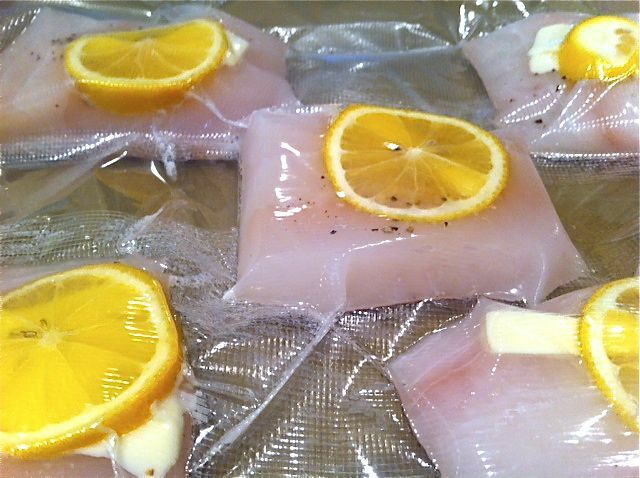 We get great halibut locally, but it is tricky to cook without drying it out, the sous-vide really helps. You have the best and most unique recipes! Thank you- and thanks so much for reading!